Lillian’s reactive airway has been under such control. She was on the lowest maintenance steroid medication and I could not remember the last time we had to use her rescue inhaler. Like any asthma mama, I have rescue inhalers stashed everywhere and yet could not remember the last time I had to dig one out for her. I was even a little fuzzy as to where they all were. I got cocky. I had swagger. We were going to beat this thing, look at how much she has improved! She had a few colds over the winter and no bad reaction, we were dancing on air. June 2016. You nasty, brutal and maniacal jerk. It started with a bad chest bug. One that went through all three of us at one point. It was the type of chest bug that lingers in the chest and has a productive, pain of a cough that will not abate. During this bug I had her checked by the Doctor twice for fevers that came and went, ear infections and yes, chest checks. 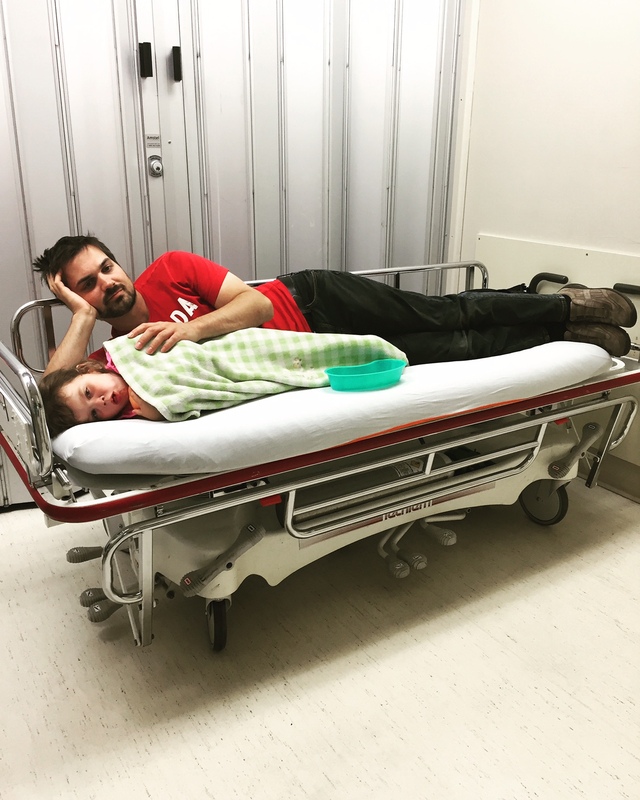 Everything came back clear, “just a virus,” which only served to feed my confidence monster that she was healing and no longer having as reactive of an airway. we found ourselves in emerge. She developed a new virus only three days after the three week long virus finish. At first it was innocent enough, runny nose and a tickle cough. I picked her up from preschool on the Tuesday after work and brought her home. Tuesdays are soccer night and she was just beginning to love it. She was elated we were going to go, playful, eating but this tickle cough was getting the best of her. I dug out the rescue puffer and gave her two puffs, then two more as per doctor’s orders. And it did not seem to work. Half way through that evening, not even getting to soccer, she descended in to one of the worst attacks we have ever had. She could barely get through a minute without coughing, coughed repeatedly to the point of vomiting and could barely catch her breath. The rescue puffer was not even touching it so into the emerge we went as per her asthma protocol. Matt works with the hospitals and warned me on the drive in that the new Resident rotation was just beginning and thus we had no idea sort of treatment we could be in for. New residence are not known for the best care, bedside manner or even tact. After checking in and being thoroughly scolded by the triage nurse for not giving her obscene amounts of rescue puffer instead of coming in, they walked us back to the children’s area to wait to be seen. It was a busy night at the hospital or perhaps it was a bit of a new Resident slow down but we were placed in a small room, at the end of the beds which is usually reserved for mental health patients (appropriate, #2 loss parent alert.) The room was nice for the privacy and had more room so Matt laid down with her while I paced and tried to keep my crazy contained. The Resident came in and introduced himself to Lillian first, winning points with me instantly. He had a broad smile and began to go through his gigantic check list of questions, of which I could recite with him. And the dreaded, family history. “Any siblings?” His eyes smiled at me behind his PPE visor. His eyes softened and his gaze met mine. “I am so, very, very sorry.” And he meant it. He seemed young, I would not assume a father but he got it. Sadly the emergency room did not “get” Lillian. They declared her reaction viral and did not give us any assistance other than the rescue puffer and sent us on our way. Arriving home that night at two-thirty am I pulled her into bed with us where I could keep an eye on her breathing. By four am she had a fever of forty celcius and I knew we would be off to her airway specialist in the morning. Her specialist barely glanced at her before announcing this a full blow reactive airway reaction. He then explained that in RA children’s airways react and swell when coming into contact with triggers, in Lillian’s case her only triggers are virus’. That swelling takes up to a month to return to normal. A month. 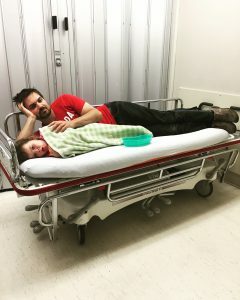 A month for her airway to recover from one bug if it is badly hit, therefore her airway was taking on a second bad bug with swollen, half closed airways. Treatment given and maintenance puffer increased and my ego smacked hard. Did I actually think I could will her well? Did I actually think it would be over so soon? In the days to follow sadness and grief reigned as I attempted to reconcile that perhaps maybe, maybe she won’t outgrow it. Maybe it will be asthma for the rest of her life? Maybe she won’t play sports or be able to sleep outside of air conditioning in the humid summer? Maybe this is just…it? And then I got pissed. Hot tears, white knuckled pissed. Part two: To be continued.